Approximately 10 plump bulbs of fresh CA garlic measuring about 16" from bottom to very top . An attractive way to store fresh garlic for all of your cooking needs, simply break garlic heads off from top to bottom as needed. Will last several years for decorative use. Pictured on the far right. Excellent for all cooking projects, wonderful gift giving too for those garlic lovers in your life! It has been very difficult to find REAL garlic in FL. So much of it is coming from a very unwholesome source. Luckily I was able to get one of the last small garlic braids from The Garlic Festival. It came wrapped with such care and arrived in beautiful condition. 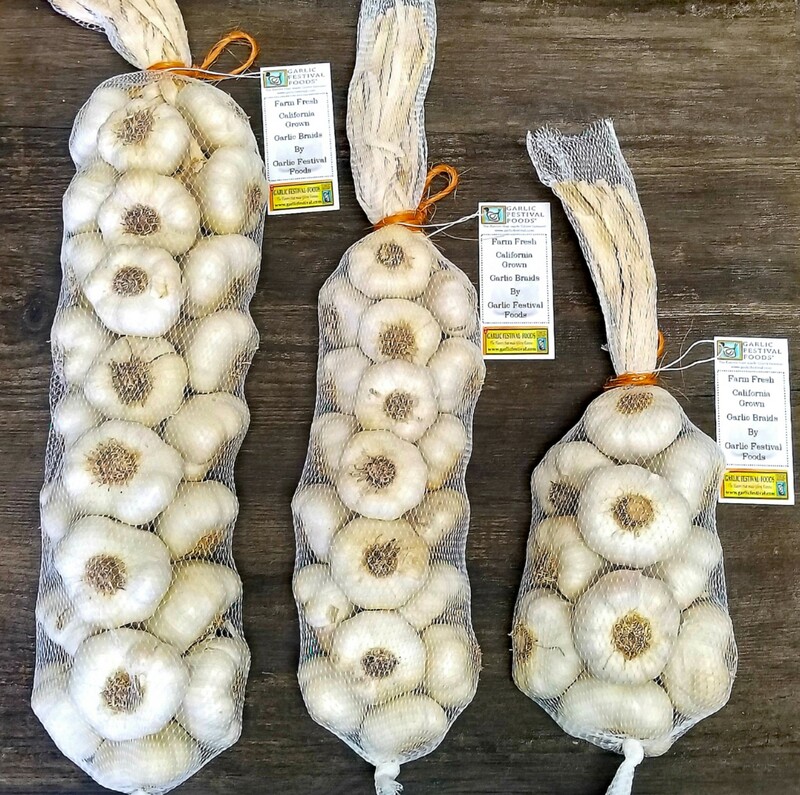 The bulbs are fresh and tight and the garlic is bursting with flavor and juice. Will get through this one very quickly so I hope the new crop will be ready soon! Awesome! Soo flavorable. Absolutely the best. My friend and I originally found you by attending a local craft fair and then reordering from your website. I have ordered garlic from you in the past and am always happy to get the really fresh garlic from your company. I could smell it when I opened the package. I am looking forward to using this in many recipes!